Hey all you spring chickens! As we head toward Easter, Mother’s Day and Father’s Day, I wanted to put together a recipe that could easily be used for brunch and also be adapted to accommodate a few people or many. 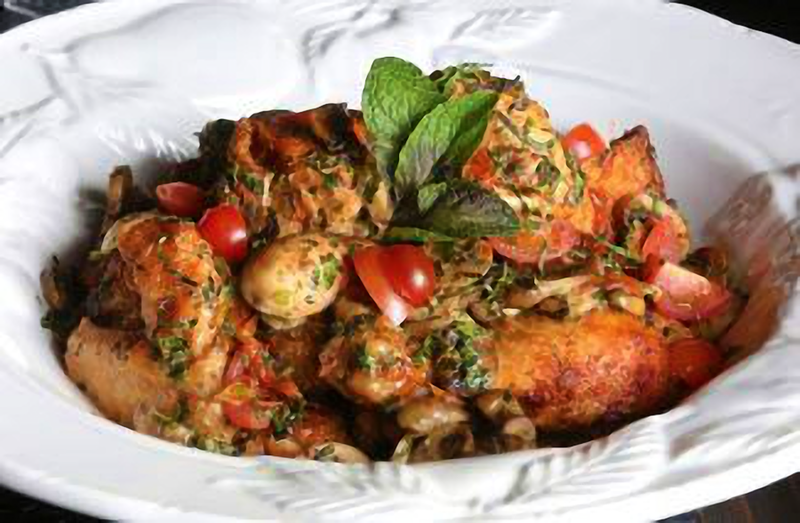 Today’s recipe, Charlie’s 16-Clove Garlic Chicken, leans more toward the lunch component than breakfast and is offered in the spirit of creating an event that allows families to gather sharing time, love and conversation over good food. Cafe at Adele’s talented sommelier, Steve Sanchez, recommends serving Elouan Winery’s Pinot Noir. This Pinot is the result of California wine maker Joe Wagner’s move to Oregon where the grapes from three regions have been combined to produce a unique blend that’s crowd-friendly, readily accessible and reasonably priced, about $20 per bottle. Yummmy! While the oven is heating, lightly flour the chicken pieces. Place chicken in a roasting pan with a touch of extra virgin olive oil to prevent sticking. Place in oven and roast for 20 minutes. Then reduce oven to 300 degrees and continue roasting the next 20 minutes. Pour all the sauce ingredients into a saucepan, and whisk over medium heat until completely mixed. Turn down to simmer. Stir occasionally. After the chicken has cooked for the time above, remove from oven, patting off any excess olive oil with a paper towel. Transfer to an oven-friendly serving dish, at least three inches deep, and pour the sauce evenly over all the pieces. Return to the oven at 300 degrees for another 20 minutes, basting once or twice. Remove from the oven. Sprinkle with parsley and mint. Of course, I strive always to use the freshest ingredients and encourage everyone to use organic, free-range chicken if possible. The benefit is the humane manner in which they are raised and that they are chemical-free. I believe that in addition to the health component to ourselves and superb flavor. You can find organic chicken at local grocery stores with ease. When it comes to garlic and garlic seed production, Nevada is second in the nation, right behind California. Glorious Garlic Farm in Washoe Valley grows many more than a dozen varieties, some of which are unique early spring varietals. Cafe at Adele’s is fortunate to use its garlic in our recipes throughout the year. Contact owner Arnold Carbone for garlic, or even better, for seed to grow your own, at 775-720-2415 or on Facebook at http://www.facebook.com/GloriousGarlicFarm.